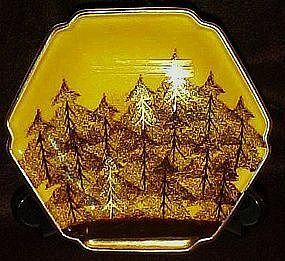 Unusual plate, or shallow bowl, made in Japan (Back has Oriental writing). Measures 7" in diameter, six sides and is 1" deep. Forest design with some gold tree top accents. Made of thick glazed porcelain. Perfect condition. All-over crazed effect.